Home > Food/Drink > Amazon Add-on Item: Kind Healthy Grains Bars, Oats & Honey with Toasted Coconut, Non GMO, Gluten Free, 15 Bars Only $3.96!! 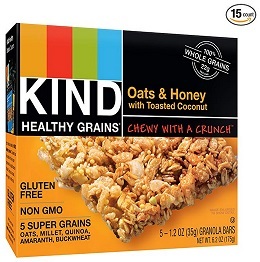 Amazon Add-on Item: Kind Healthy Grains Bars, Oats & Honey with Toasted Coconut, Non GMO, Gluten Free, 15 Bars Only $3.96!! December 23, 2018 Comments Off on Amazon Add-on Item: Kind Healthy Grains Bars, Oats & Honey with Toasted Coconut, Non GMO, Gluten Free, 15 Bars Only $3.96!! Amazon has the Kind Healthy Grains Bars, Oats & Honey with Toasted Coconut, Non GMO, Gluten Free, 15 Bars marked down to only $3.96!! Tikie and other Girls Clothing Brands On Sale On Zulily – Up To 75% Off!